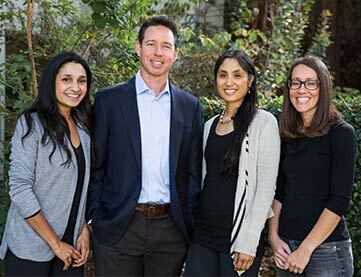 Welcome to Dr. Rabitz Pediatric Dentistry in Willow Glen and Los Gatos Pediatric Dentistry in Los Gatos. Our experienced team of professionals are committed to helping your child build and maintain a healthy smile for life. When you visit our dental office, you and your child can expect to be treated with respect. By using a playful approach and gentle chairside manner, our team can get even the most hesitant children to relax and accept dental care. Our goal is to protect your child’s teeth and gums and inspire good dental care habits for lifelong oral health. We have two convenient locations. Call Los Gatos Pediatric Dentistry or Dr. Rabitz Pediatric Dentistry to schedule your child’s visit. We offer preventive, therapeutic, and restorative treatments starting at one-year-old. This is the best time to start oral health care, as your child’s dental development becomes more visible at this age. Our dentists can spot areas of concern and stop them from becoming an issue. Because toddlers aren’t caring for their teeth yet, they’re especially vulnerable to cavities. Establishing a relationship with the dentist early on can get them on the right track before any serious damage or bad habits can develop. A healthy smile reflects sound health. Our dentists consider every aspect of your child’s oral health to protect their smile and overall well-being. Receiving quality dental care is essential to your child’s oral and overall health. When you put your child’s oral health in the hands of dentists like Dr. Rabitz, Dr. Suzy, Dr. Lam and Dr. Chanel you can have confidence that visits will be successful and as comfortable and pleasant as possible. The key to preparing your child for a lifetime of essential dental care is by creating a positive environment at the dentist's office. Our team knows how to ease kids into showing us their smile by working with them at their own pace so that they won't feel overwhelmed. Clean and floss the area around the sore tooth. Rinse the mouth with warm salt water. If the face is swollen apply a cold pack. Take Tylenol or Ibuprofen as directed for pain and call us as soon as possible. Find the tooth or broken tooth fragments. If the entire tooth is knocked out, rinse the tooth gently without scrubbing, then attempt to reinsert it in the socket. If unable to reinsert the tooth, keep the tooth moist in a cup containing milk or water. Immediate dental attention is necessary. Fold and pack a clean gauze and place over bleeding area. Have the child bite the gauze for 15 minutes. If bleeding persists call us. Your child should avoid chewing ice or eating hard or very chewy candy which can damage the sealant. Regular dental appointments are recommended in order for your child's dentist to be certain the sealants remain in place. My children love going to the dentist and have healthy teeth, thanks to Dr. Rabtiz. Dr. Rabitz and his team are great! We love Los Gatos Pediatric Dentistry! Everyone is kind, helpful and knowledgeable. Dr. Chanel is wonderful with the kids as well as us, the parents. Thank you!